The Auscultatory percussion of the stomach plays a major role in QBS. The doctor who knows about this method, and how to apply it properly and safely, can see, easily and quickly, at the bedside, a large number of signs and reflexes, enabling him to recognize different diseases, potential or even in their pre-clinical stages. Notably, the stomach is innervated by two plexus gastric nerves connected to the solar plexus, where a large number of reflexes, originating from almost every tissue and organ, end up For example, if we stimulate with a digital pressure the nail or, alternatively, the trigger-points of the investigated parenchyma, we can observe that in the stomach occurs modifications of its shape and volume, termed 'gastric aspecific reflex', vagal and sympathetic. 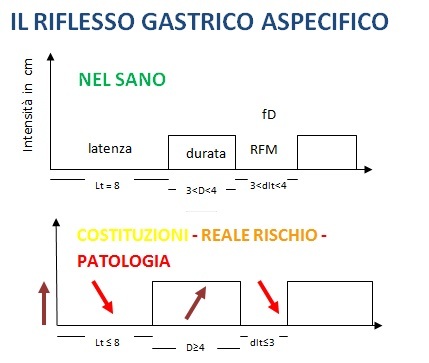 Furthermore, in case of overt disease (Figure 1), in case of 'Inherited Real Risk' of cancer and in rheumatic and autoimmune diseases, after the dilation there is a tonic gastric contraction. The patient lies in a supine position, psycho-physically relaxed with open eyes to reduce the secretion of melatonin (Figure 2). 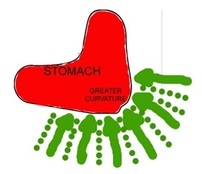 We have to delimit a small piece of the large gastric curve in its lower segment, given that the stomach can be positioned differently depending on the physical structure of the patient (Figure 3). 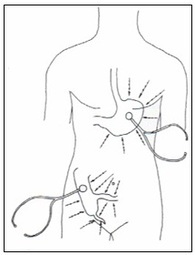 The patient helps the doctor holding the drum of the stethoscope on the skin projection of the percussed organ (e.g., stomach, ureter) with a finger-pulp (Figure 4). In the case of gastric aspecific reflex, the drum of the stethoscope is fixed to any point on the skin projection of the stomach. The medical doctor performs the percussion with the middle finger bent hammer, directly, smoothly and gently on the skin (radial lines of percussion, green dots in Figure 5), twice in succession on the same spot before moving to the next step going towards the drum of the stethoscope (green arrows, Figure 5), along centripetal and centrifugal lines as quickly as possible, always stopping the percussion just before the great curvature of the stomach (green dots, Figure 5). Warning! When the percussion beats "directly" on the skin projection of the stomach (or cutaneous projection of any viscera, red area in Figure 5) the sound of percussion is perceived clearly modified, stronger, and seems to "have originated near the ears of the doctor." At this point, it is advisable to carry out the percussion again, for the second time, at least in the early stages, when there is no great experience, in order to avoid some errors, for example, due to a peristaltic wave. The digital percussion must be only on the green dots (points of percussion), and never on the projection area of the bowels (the red area - Figure 5 - must never be beaten). The digital pressure made with a well-defined intensity (light, moderate, medium, intense) applied to the skin projection area of the heart (precordium), brings about several significant cardio gastric (and caecal) aspecific reflexes (cardio - GAR). If the pressure is intense, this manouvre provokes the sign of Caotino, useful to diagnose the presence or absence of Inherited Real Risk of CAD (Coronary Artery Disease) or the overt cardiopathy. The Cardio - G.A.R., in case of digital pressure of medium intensity on the trigger points of the heart, is characterized by three key parameters: latency time (Lt) in sec., intensity (in cm) and duration of the reflex (in seconds). The time that lasts from the beginning of the percussion till the initial auscultation of the reflex is called latency time (Lt), and is measured in seconds. The time between the first initial listening of the reflex to its end is called duration of the Reflex( D), and it is also expressed in seconds. The intensity (In) of the reflex refers to the gastric dilatation observed and / or its contraction, and it is expressed in centimeters (Figure 7).